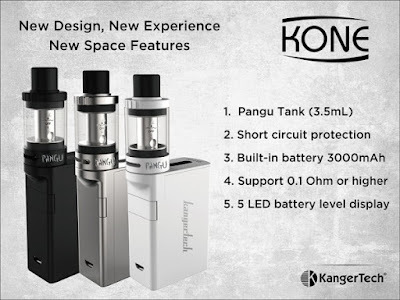 Kanger Kone Starter Kit is consist of Kanger Pangu tank and Kanger Kone mod. It comes with three colors for you to choose. The Kanger Pangu is a 3.5ml capacity tank that is designed for both mouth to lung and direct lung vaping styles.